The story begins with a familiar scene for many parents. It’s a rainy day and Johnny cannot go outside. His mother suggests that he read a book, but Johnny does not want to read. In school he is often a victim of bullying because he reads too slowly and has trouble sounding out the words. 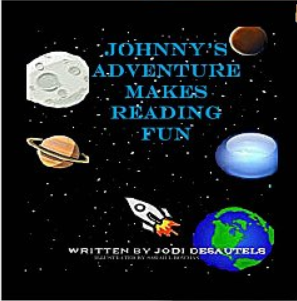 Fortunately, Johnny’s mom encourages him by inquiring what kind of adventure would he like to experience. Maybe he could transform himself into a hunter, king, acrobat or adventurer. When he says that he he would like to travel to outer space, she accommodates him by helping Johnny find a helmet, walkie-talkies and a refrigerator box for a spaceship. Together they use their imaginations and bodies to act out a space launch scenario. Johnny now feels so much better about himself. His mom takes advantage of that to urge him to write and illustrate a story about the adventure. She continues to draw him into conversations that will extend learning as he gets deeper and deeper into the project. In no time at all, Johnny has stretched his knowledge base and enriched his vocabulary. This book will not only provide an enjoyable story of encouragement for reluctant readers in the early grades of elementary school, but also allows parents and teachers to use it a a teaching model. This adventure provides a warning about the effects of bullying on the self-esteem of children. The author makes her points simply and effectively. I recommend that you take a look. Wonderful to hear about books that encourage reluctant readers to enjoy books.